This module provides an introduction to polar-orbiting-satellite-based microwave remote sensing products that depict moisture and precipitation in the atmosphere. 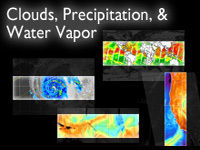 The module begins with definitions and descriptions of total precipitable water and cloud liquid water products, contrasting each with more familiar infrared water vapor and window channel products. This is followed by an overview of microwave precipitation estimation and a discussion of how polar-satellite products compare with those from geostationary satellites and ground-based radar. A series of case examples highlights potential weather forecasting applications for total precipitable water and precipitation products. The module also includes an introduction to the Global Precipitation Monitoring Mission to which future NPOESS satellites will be an important contributor. This module takes about 75 minutes to complete. questions are a bit vague in the Quiz Review of material and quiz needs to be done. This is a good module to study microwave remote sensing. However, I find the presentation quite disturbing. It would be better if it's purely modules without videos, or the videos are separated as well. Or, it would be the best if videos are not playing while we study the lesson. The lesson increased my understanding of the topics. Strongly recommend for satellite remote sensing. THIS LESSON REQUIRE TO BE SOME MORE SPECIFIC.